SSL certificates are used within web servers to encrypt the traffic between the server and client, providing extra layer of security for users accessing your applications. Let’s Encrypt provides an easy way to obtain and install trusted certificates free of cost. 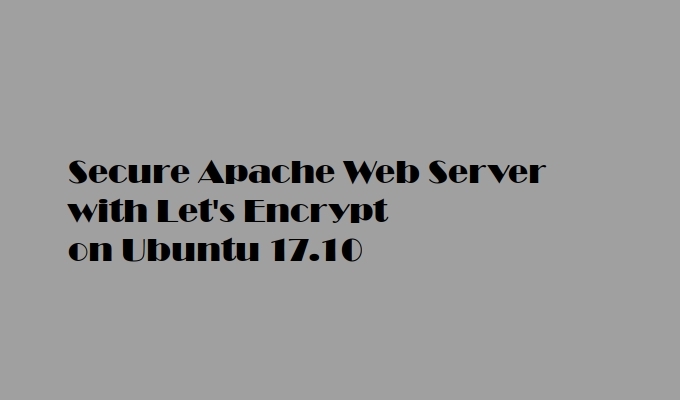 This guide will walk you through the steps, how to set up a TLS/SSL certificate from Let’s Encrypt on an Ubuntu 17.10 running Apache as a web server. The steps outlined in this tutorial also applies on earlier release of Ubuntu. If you are done with above prerequisites, you are ready to begin by log into your server using sudo-enabled user account. Generating the SSL Certificate for Apache using the certbot Let’s Encrypt client is pretty straightforward. The client will automatically obtain and install a new SSL certificate that is valid for the domains provided as parameters. For this example, the base domain will be yourdomain.com. In this tutorial, we demonstrated how to install a free SSL certificate from Let’s Encrypt in order to secure a website hosted with Apache Web Server.